Ralph Northam Is A Small Piece Of The Shift In Race Politics In The Trump Era The Virginia governor is a man on an island, and people in both parties are calling for him to step down. But how the parties have handled race in the Trump era is very different. Virginia Gov. Ralph Northam, with his wife, Pam, speaks with reporters at a news conference Saturday in Richmond, Va. The highest reaches of the Democratic Party inside and outside the state have said he should resign over a racist photo on his medical school yearbook page from 1984. House Speaker Nancy Pelosi, presidential candidates and, perhaps most important, both of Virginia's senators and its longest-serving black representative all said Northam should step aside. 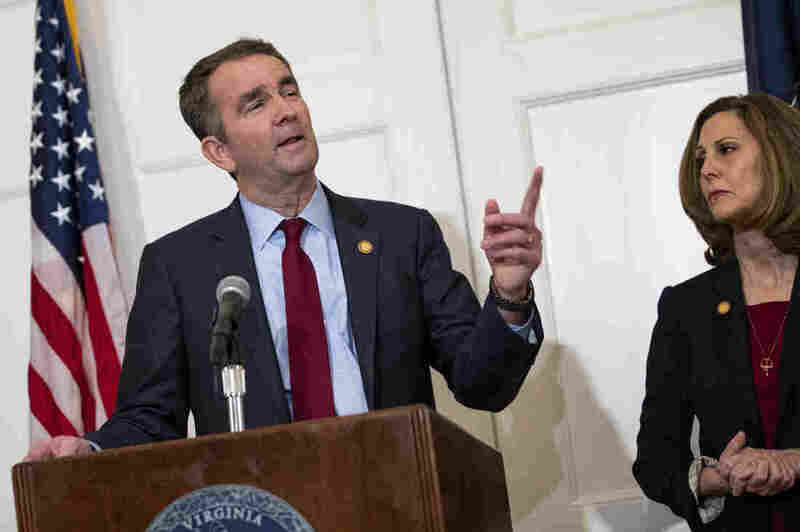 Northam didn't help himself Saturday with a news conference in which he compounded matters. He denied he was in the photo — after first apologizing for it Friday — and then said he had used shoe polish to darken his face to look like Michael Jackson for a dance party in the 1980s. He had learned to moonwalk, he said. What do they say about what to do when you're in a hole? Sens. Tim Kaine and Mark Warner, as well as Rep. Bobby Scott, all Democrats, said in a joint statement after Northam's Saturday news conference that "we no longer believe he can effectively serve as governor of Virginia and that he must resign." Prior to issuing that statement, they had already called Northam to tell him that themselves. The entire episode shines a light not just on Northam's troubles but also on the politics of race in the Trump era. Democrats are saying that if they hope to have the moral high ground, they have to have zero tolerance. Rep. Lloyd Doggett, a Democrat from Texas, said on CNN Monday he doesn't think the Democratic Party can stand up to the "bigotry" of President Trump with Northam still in office. "I don't think we can do that," he said, "unless we hold all of our officials to a high standard." Trump tweeted that what Northam did was "unforgivable!" But lots of people saw irony in that. Trump, after all, from the day he launched his presidential run in 2015, said Mexico was sending rapists and drug dealers to the United States; exploited white grievance to win the presidency; and as president expounded a kind of moral equivalency between white nationalists and those protesting them after the deadly, racially tinged violence in Charlottesville, Va.
Democratic Sen. Sherrod Brown of Ohio, who is seriously considering a presidential bid, pulled no punches Sunday in an appearance on NBC's Meet the Press. "We have a president who's a racist," Brown said, noting Trump's role in the birther movement, in which he questioned former President Barack Obama's birthplace; Trump's family's role in alleged housing discrimination decades ago; his response to Charlottesville; and his administration's role in what Brown called "suppressing the vote." Democrats see a double standard in the Trump era. They point out that Northam and Al Franken before him had to go (Franken for sexual misconduct allegations), but Trump, Iowa Rep. Steve King (who questioned how the terms white nationalist and white supremacist became offensive) and Sen. Cindy Hyde-Smith (who landed in hot water over her own past racially tinged remarks) got to stay. Some Republican leaders spoke out and chastised King. "I think he should find another line of work," said Liz Cheney, the House Republican conference chairwoman. And a Republican former secretary of state from Florida, Michael Ertel, quickly resigned last week and apologized for wearing blackface in 2005. But Trump never called on King to step down, and neither did House Republican leader Kevin McCarthy — though McCarthy has been much more definitive when it comes to Northam. Trump also flew to Mississippi to support Hyde-Smith ahead of her election, which was tighter than Republicans would have liked. The line has been hard to define in the Trump era for what sticks and what doesn't, what's appropriate and what's not. But Democrats believe Northam needs to go, so they can continue to speak with some moral authority during Trump's presidency. Democrats have a complicated history on the issue of race. Theirs is the party that nominated the first black president, but it was also once the party of "Dixiecrats," who opposed much of Lyndon Johnson's Great Society program, including the Civil Rights Act. Johnson himself used racist language. "We've come a long way from where the party was in the '50s and '60s," said Doug Thornell, a Democratic strategist and former Democratic leadership aide on Capitol Hill. "Now, we're a party of inclusion and diversity. That's reflected in the candidates running for president, the House majority, with a historic number of women and people of color. ... It's a sea change from when we had 'Dixiecrats.' "
The swift reaction to Northam is evidence of that change. Northam is a reminder for many in the party of where it was, not where it's going. The shift, which has seen a political regional realignment over the past few decades, has been punctuated by Trump's presidency. What it means to be a Democrat has taken on a very different form. "It's a totally different party," said Jamal Simmons, a Democratic strategist, who served as an adviser to the Democratic National Committee during Obama's 2008 presidential campaign and worked on Bill Clinton's 1992 campaign. "Barack Obama's victory in 2008 taught a lot of younger African-Americans that their political needs and desires don't have to be put in the back seat anymore," Simmons added. "They can have an impact on American politics. Black Lives Matter was such a big deal because people were unwilling to put issues of policing on the back seat even in front of a black president." Simmons, who is not affiliated with any presidential campaign, thinks that change could make matters difficult for former Vice President Joe Biden if he chooses to run for the White House in 2020. Simmons noted Biden having called Obama "clean" and "articulate" and saying "you cannot go to a 7-Eleven or a Dunkin' Donuts unless you have a slight Indian accent," as well as his handling of the Anita Hill-Clarence Thomas hearings and his support for the 1990s crime bill. Obama not only forgave those comments but also asked Biden to join him on the ticket. The two even became good friends. But in the Trump era, times have changed and the scrutiny on issues of race and gender has intensified. "Things that seemed OK in earlier eras no longer seem OK," Simmons said. "And when those things get litigated in today's light, they don't often look very pretty. You have to be prepared to run in a party that is not very forgiving of past indiscretions on these issues of identity and gender." Thornell noted that many of the candidates have had to answer for past statements or policies — Sen. Kamala Harris for her days as a prosecutor and defending tough-on-crime tactics, Sen. Kirsten Gillibrand for her more conservative positions on guns when representing an upstate New York congressional district, Sen. Cory Booker for his defense of Wall Street and the pharmaceutical industry, Sen. Elizabeth Warren for her DNA test trying to prove her Native American ancestry, for example. "No one's perfect here," Thornell said. "No one is going to have a completely clean record on all of these issues. I think that how they confront is — how they explain it — is going to be important."